The last time we went to a concert, stopped by Mkt Bar. We're back for a repeat before a concert. We were smart this time, arrived early and got the last table of the whole place. 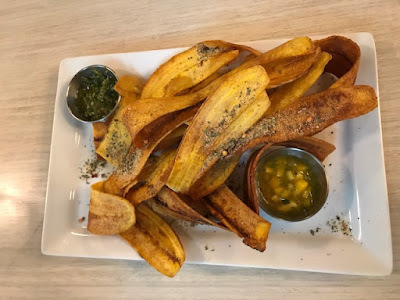 Got the yummy plantain chips with the mango sauce and chimichurri yummy goodness. Got the Melon Cooler, which is not exactly much melon more like prosecco all the way with a slice of cantaloupe. Got the Bayou City Slider, which is little ground chuck with bacon, cheddar, barbecue sauce and in brioche roll. I had to skip the rolls because it was too much food. But it was all very delicious and fresh. We ordered the apple baklava, wow so decadent. It is like apple pie but add cinnamon and walnut, and cinnamon ice cream. So good. Thank goodness we shared it, it would've been too much otherwise. The place is super casual, you grab a seat, if there's a concert, good luck. The wait staff are pretty observant, they saw us sat down and brought over the menus and got our orders quickly. Get us on to our show quickly too. Of course, the food is good, so no complaint there. You can call ahead and get a reservation, they are pretty good about that.